Family Fun at Ag Field Day! We all know that spring brings warmer weather, greener grass, and sunny days…but the best gift of spring is the foals! Here at the Rutgers Equine Science Center, we have one of our very own! Foals are so cute with their fluffy tails and wobbly legs, and are much more developed than newborn humans. 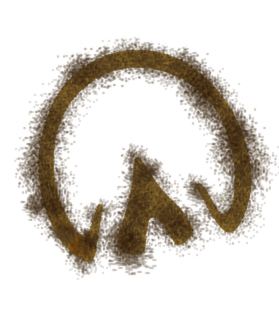 The horse is a precocial species, meaning that newborn foals are neurologically mature after birth. This is because horses are prey animals in the wild and are most vulnerable immediately after birth, so they must be able to identify danger and flee if necessary. In fact, a foal will usually stand within an hour of being born (after a few failed attempts of course!). Can you imagine a human baby being able to stand an hour after being born?! 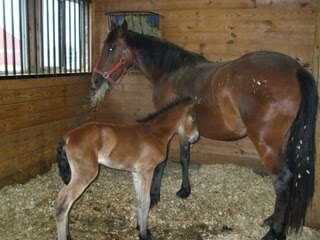 The new Rutgers foal’s name is RU Skylark and belongs to one of the mustangs in the Young Horse Teaching and Research Program named RU ShyAnne. Both mother and baby will be on display (along with the other mustangs in the program) at Ag Field Day at Rutgers Day on April 30th at the Red Barn on the G. H. Cook Campus in New Brunswick. If you really fall in love, some of the mustangs will be available for bid at an auction held on Sunday, May 1st at the same location. 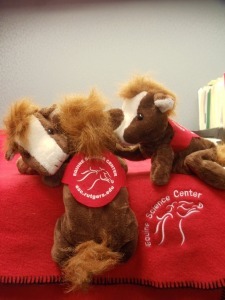 If buying a real horse is out of the question, stop by the Equine Science Center’s stand and get yourself the next best thing…a Lord Nelson beanie baby! They’re just as much fun, they’ll fit in your car on the ride home, and the best part is you’ll never have to clean up after them! I look forward to meeting all of you, my loyal followers, on Saturday!